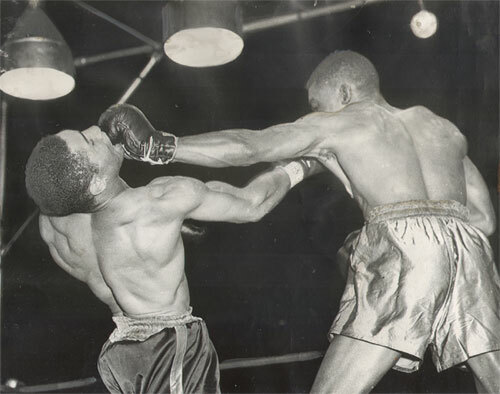 On this day in 1948, lightweight king Ike Williams swarmed former two-time champ Beau Jack in round six of their bout at Shibe Park to retain his title by TKO. The pair fought evenly over the first five rounds, but near the end of the fifth, Jack appeared to tire a bit, no doubt a consequence of his struggle to make the 135 pound weight limit. This was not quite the same windmill brawler from the south who tirelessly waged so many memorable all-action wars in the past. And this little let down by Jack was all that a prime Ike Williams needed to gain the advantage. He opened the sixth round with a blistering attack that had Jack helpless. Williams paused a moment and looked to referee Charley Daggert, as if hesitant to administer more punishment. When the referee did not react, Williams blasted Jack with another round of heavy artillery that repeatedly snapped the challenger's head back. With the Beau's legs spongy, Williams once again paused. But Daggert held steady and let the bout go on. Finally Williams let loose for a third time. The attack was deadly enough to make Daggert jump in and end the fight. The time was 33 seconds of round six. Afterward, the always game Beau Jack couldn't understand why the referee had stepped in.